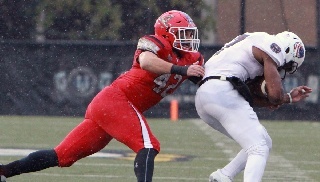 Youngstown State senior linebacker Armand Dellovade has been named to the Missouri Valley Football Conference's preseason all-league first team, the conference announced on Wednesday. Sophomore cornerback Bryce Gibson is a second-team preseason all-league pick. A two-time second-team All-MVFC pick, Dellovade is joined on the first team by North Dakota State's Jabril Cox, Missouri State's Angelo Garbutt, UNI's Rickey Neal and South Dakota State's Christian Rozeboom at the linebacker position. In his YSU career, Dellovade has been credited with 235 total tackles in 38 games played. Impressively he has stared 36 contests in his three years with the Penguins. Last year he had 76 total tackles and as a sophomore registered a career-high 105 stops during the Penguins' 16-game campaign. Gibson had a breakout year in 2017 starting all 11 games at cornerback as a true freshman. He was named to the Valley's All-Newcomer Team in 2017. YSU had five first-team preseason MVFC selections trailing just NDSU which had eight. Yesterday, Tevin McCaster, Steven Wethli, Gavin Wiggins and Vitas Hrynkiewicz were named first-team All-MVFC.